FILE - A shackled detainee is being escorted away from an Administrative Review Board hearing, at Camp Delta detention center at the Guantanamo Bay U.S. Naval Base in Cuba, Dec. 6, 2006. A report giving a brief synopsis of each of the more than 100 detainees still being held at the U.S. naval base in Guantanamo Bay, Cuba, was released Wednesday by a critic of the Obama administration's plan to close the detention center. The Pentagon gave the report to Republican Sen. Kelly Ayotte, who posted it online Wednesday. The information in the unclassified report details each of the 107 detainees being held in Guantanamo as of November 25, 2015. The detainees vary from former al-Qaida bomb makers and bodyguards to low-level militant cooks and medics. Many of the detainees have been held without charge for more than 14 years. About 30 have been released since November and the prison currently holds 76 detainees. Of those, more than 30 have been cleared for transfer out of the prison. Ayotte said the report highlights the detainees' past terrorist activity and their continuing extremist views, and is an indication of why they must remain in prison. 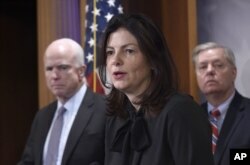 FILE - Sen. Kelly Ayotte, R-N.H., center, flanked chairman Sen. John McCain, R-Ariz., left, and Sen. Lindsey Graham, R-S.C., speaks during a news conference on Capitol Hill. "Most of the detainees who remain at Guantanamo are the worst of the worst, as demonstrated by the fact that 93 percent of the detainees who remained there as of late last year had been assessed as a high risk for a return to terrorism," she said in a statement. She has said closing the detention center is a security risk and has pushed the Pentagon to release more information on those being held at the naval base. "By clearly detailing some of the disturbing terrorist activities and affiliations of detainees at Guantanamo, the report demonstrates why these terrorists should not be released -- they pose a serious risk to our national security," the New Hampshire senator said in an email statement. FILE - The front gate of Camp Delta is shown at the Guantanamo Bay Naval Station in Guantanamo Bay, Cuba. Pentagon spokeswoman Lt. Col. Valerie Henderson said Wednesday the information in the report has been publicly available for some time, for "several years," in some cases. David Remes, a human-rights lawyer who represents several detainees, said dangerous men are not being released. "Holding the men at all was a deep injustice and a lasting stain on the U.S. 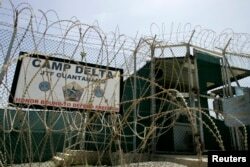 These men shouldn't have been in Guantanamo in the first place," Remes told The Associated Press. "It's one thing to prosecute detainees for attacks on the U.S. ... It is quite another thing - and contrary to the values the U.S. says it is committed to - to hold men for many years who are accused of no crime." On his second day in office in January 2009, President Barack Obama issued an executive order directing the U.S. prison in Cuba to be closed. However, the Republican-led Congress has stymied his efforts to do so. In addition to transferring some inmates to other countries, Obama would also like to send some of the inmates to the United States for incarceration, but Congress also has opposed that proposal. The prison was opened in January 2002, four months after the terrorist attacks on New York and Washington and shortly after the ensuing U.S. offensive began against the Taliban in Afghanistan. Guantanamo once held nearly 800 men, but then President George W. Bush transferred more than 500 of the detainees to other countries for prosecution or imprisonment. So far, Obama has transferred 162 detainees to other countries.